Electrical & High Voltage Transformer | Dry and Oil-Filled Transformers | Coil Winding Specialist Inc.
Distribution transformers are high power or high KVA (up to 1000 KVA or 1MVA) and are usually a step down electrical transformers used for the distribution of electric power. Distribution electrical transformer can be single phase or 3 phases, and usually mounted on a pad. These electrical transformers are either dry type or oil filled. In the distribution of electrical power by the utility power generator, the high voltage transformers are used to do the transmission or distribution over large distances. The high voltages mean the current through the cables can be lower, and since the copper losses are square of the amperages, this will minimize the power loss over the great distances. At the destination, these high voltage electrical transformers steps down into lower voltage and so that they are useable before it enters into a building. 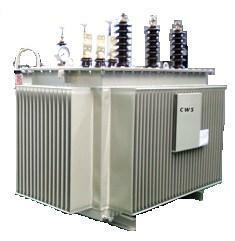 CWS designs and manufactures high voltage transformers from 415 volts to 22,9000 volts, mainly in 3 phases. These electrical transformers ranges from 100 KVA to 1,000 KVA and are designed with amorphous cores or grain oriented silicon steel lamination cores. Both dry and oil filled distribution electrical transformers using grain oriented silicon steel lamination are available from CWS. Single Phase and 3 Phase Oil Filled Distribution transformers are fail-safe with a long life expectancy. The fluid used are Shell Diala or BP JS-V/JS-A which are extremely stable and long lasting. Newer types of distribution electrical transformers that offers much energy savings during idling are designed and built using amorphous metals and nanocrystalline core materials. These types of distribution electrical transformer are also called Amorphous Metal Transformers (AMT). AMT are built using very thin (0.25 micron thickness) foils made of Metglass or equivalent material. 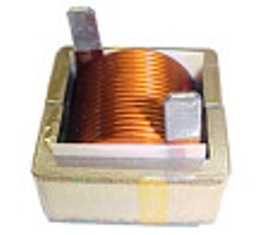 The main advantage of amorphous core electrical transformer is the core loss, which is about 75% less than a conventional silicon iron lamination core. In an electrical transformer, there are 2 classes of losses that determine the efficiency, core loss and copper loss. Core loss is the losses due to the core material during the electrical voltage transformation and is dependent on the flux density of the core. Core loss is not dependent on the amount of current flowing into the transformer. Copper loss, on the other hand, is due to the I2R losses (ampere squared multiple by winding resistance). So the higher the current, the higher is this copper loss. Amorphous core electrical transformer therefore has much higher efficiency at low or no load (idling), and not as efficient as silicon steel lamination electrical transformer at full load. This is mainly because of its lower maximum flux density requiring more copper windings. To compensate for this, AMT is built larger in size to compensate of this flux density deficiencies. CWS designs and built many amorphous core transformers for the oil field industries and a major customer who purchase CWS amorphous transformer is Shell Oil Corporation in Houston.